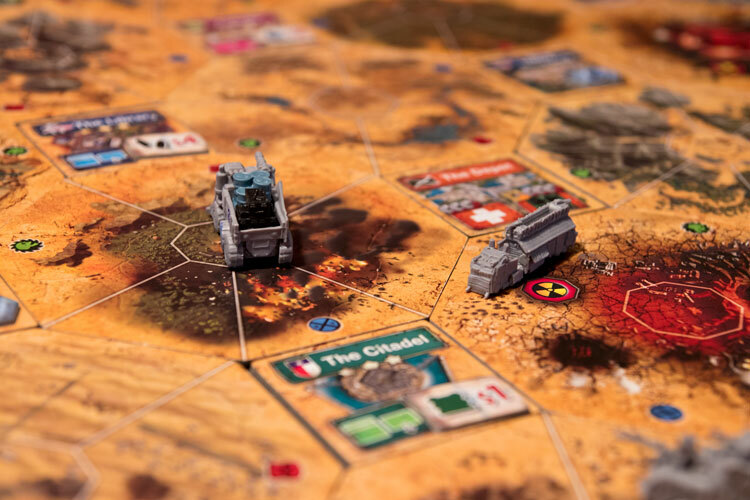 We review Wasteland Express Delivery Service, a fantastic looking pick up and delivery game published by Pandasaurus Games. 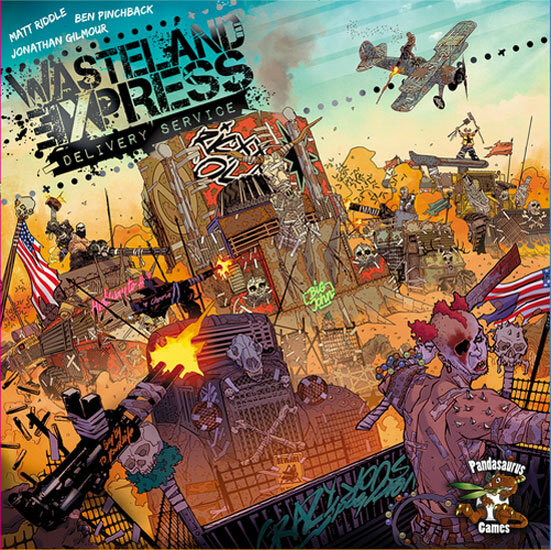 In Wasteland Express Delivery Service, players are racing across a post-apocalyptic wasteland trying to earn a living. While 2015’s Mad Max: Fury Road may have brought the post-apocalyptic genre back into the spotlight, I’ve always had a fondness for that theme. So heck yeah I was excited to try Wasteland Express Delivery Service after seeing it at Gen Con this year. Trucking across a ravaged landscape, make deliveries, fighting raiders and earning scrap (money)? Sign me up! Wasteland Express Delivery Service is a new pick up and delivery game from the minds of Jon Gilmour (Dead of Winter), Matt Riddle and Ben Pinchback (a team from multiple games, such as Fleet). It has stellar production values and a fantastic theme. But the real question is if the game play can hold up. Let’s find out. 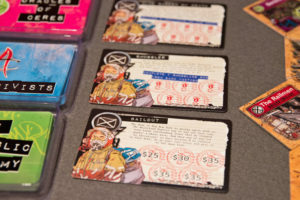 While Wasteland Express may be a pick up and deliver game, at its heart, it’s really a race game. Players are trying to be the first to complete 3 priority first class contracts. Each round, players will have 5 actions they can take. 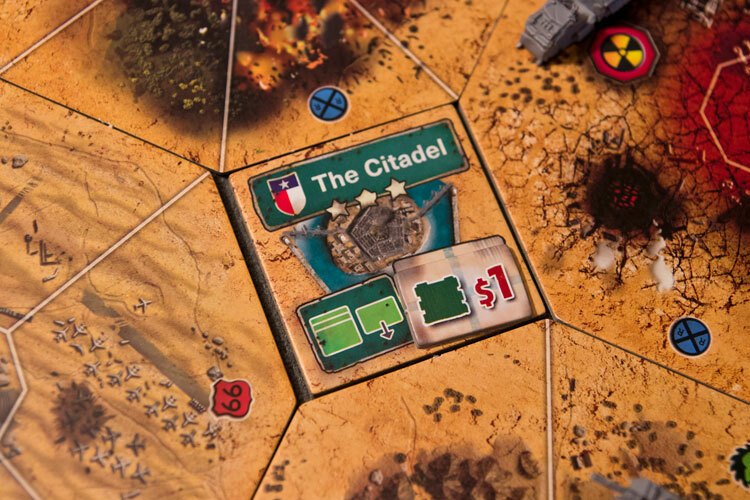 Actions are also limited based on the amount of spaces on your player board for that action. Different actions include moving, buying resources (Food, Water, or Weapons), selling, taking outpost specific actions (drawing contracts, upgrading your truck, etc. ), and pillaging raiders you defeat in combat (free resources!). The goal is of the game is to be the first to complete 3 priority first class contracts. The game’s momentum mechanic is particularly interesting. Most players start with a movement of 3 spaces. After moving, you have the option to additionally perform one of the above other actions. However, if you don’t take that extra action, you gain momentum. That means that on your next turn, you’ll move one space father. This neat little mechanic helps make sure no player spends too many turns in a row just moving. If you enter a tile with a raider truck you can choose to try and sneak past them (two in six chance to take damage) or fight them with the hopes of stealing their loot. Combat is quick and easy. Roll 2 dice (plus any truck upgrades) and try and hit their defense value. If you do, you can pillage their resources. If not, you take one damage. Finally, if you end your movement on a space with a raider icon, you get to move that raider truck. If you move it onto a tile with an opponent, they ambush that player. That’s the basics. If you want the full details, you can download a PDF of the rulebook here. The first player to complete three priority first class contracts, wins the game. Players can gain resources by buying them from outposts, or just pillaging them from raider trucks. The first thing that’s going to jump out at you with Wasteland Express are the absolutely stellar production values. Not since 2016’s Scythe or Mech vs. Minions have I been this impressed with how a game was put together. There are components galore (seriously, plan almost two hours to punch and sort everything), including great looking truck miniatures that are just begging to be painted. There are lots of trays to perfectly store everything in the game. 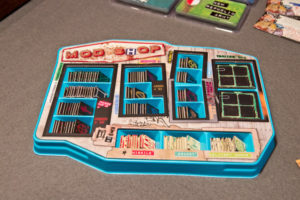 But even better is the custom insert designed by Game Trayz. Everything is nicely housed in its own tray (with lids). This makes playing the game easy as you can quickly pass around trays when needed, such as the truck mods tray which is labeled with prices! In addition to the great storage, the art is done by comic book artist Riccardo Burchielli (DMZ, Batman Black and White), and not only looks great, but fits the theme perfectly! Speaking of theme, I enjoyed how the designers spent time working it into the game. You are hauling much needed resources around the wasteland to the settlements that desperately need it. And the market prices will reflect that overall demand. If tons of settlements want water, that price is going to skyrocket. Even the event cards and contracts all have thematic text that explain why they need what they do. And for those that like lore, the rulebook even gives backstories on the factions and drivers. Each outpost will usually give you multiple reasons to visit there: Buying/selling resources or taking the outpost specific action. Diving into the mechanics of the game. I felt like the designers really did a great job in ensuring the game flows smoothly. The game play is almost broken up into micro turns, where each player does something small and quick, allowing downtime to be minimal. And as mentioned before, the momentum mechanic ensures that players have very few boring turns, even if they need to get to the other side of the wasteland. Another thing I enjoyed was how customizable the trucks are. Many start with one or two specific upgrades, but from there, you can customize to your heart’s content. Want to ignore combat? Go ahead and load up with cargo pods. Want to be a mobile tank? Well you can get lots of guns, but you still need to carry loot, so best to balance that one. But it is easy to make yourself a force to be reckoned with in combat. The end result is that this allows a lot of paths to victory. You can approach the game how you want to play it. Finally, as much as I’m enjoying Wasteland Express (and I am), not all is roses. The biggest area that’s lacking is player interaction. Other than shifting demand from sales, the only way you are going to interact with your fellow players is by sending the Raider trucks after them. And that’s not a frequent occurrence (or even that detrimental). Thematically, it does makes sense that you aren’t shooting your fellow drivers, as you all do work for the same company. While there are variant rules for PvP combat, they also feel a bit tacked on and didn’t really do much for me. The player dashboard helps manage the flow of the game, and also houses all of your truck’s mods. Wasteland Express Delivery Service was every bit as good as I hoped it would be. When I saw the great art, excellent components, and fun theme, I was hoping the gameplay would hold up. And it did! The game is flexible, allowing you to customize your truck how you see fit, and the player turns are setup in a way to encourage quick turns and minimize downtime. 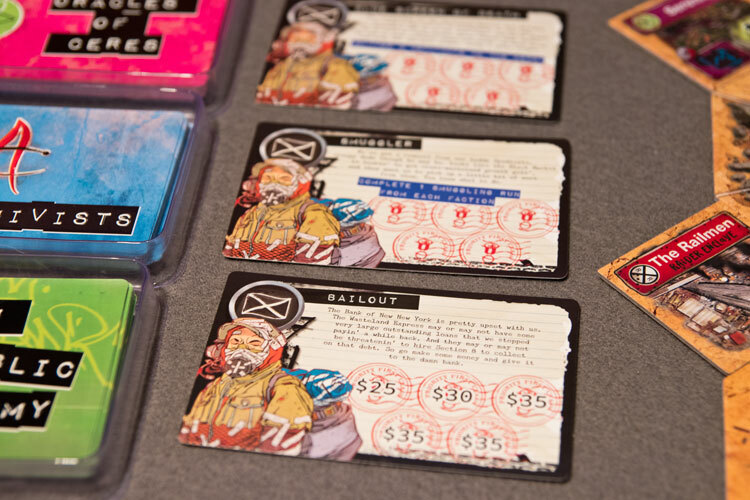 Other than the aforementioned player interaction, the only thing that I wish was different with Wasteland Express Delivery Service was to have more event cards. The deck feels a bit small and I could use some more variety, but that’s a minor quibble (and easily fixable with an expansion) with an otherwise fantastic game. 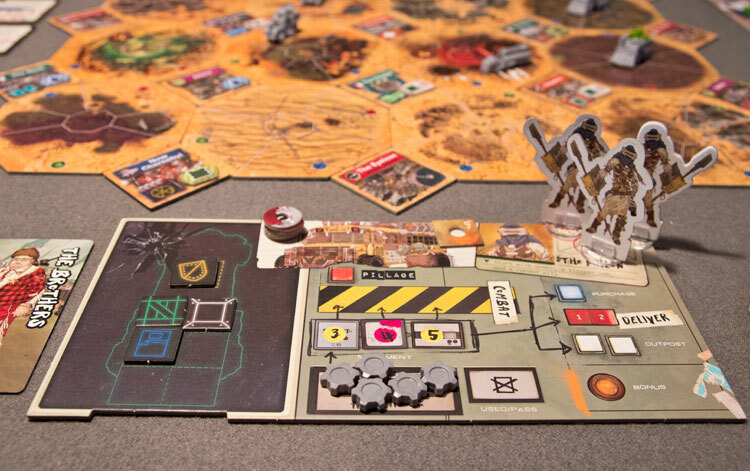 I’ve had a ton of fun romping around the Wasteland and found myself already itching to get this one back to the table. 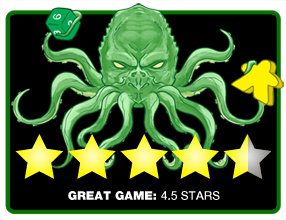 Final Score: 4.5 Stars – An excellent pick up and delivery game that both looks amazing and is a ton of fun to play.